Philmont is a village in Northwestern Columbia County, NY with a population hovering around 1,500, and with an active citizenry for its size. Philmont Beautification, Inc. captures that engagement and channels it to benefit the small stores and residents of the area. 60 percent of the homes in Philmont are rentals. Philmont Beautification recognizes that if it can change some of those rentals into homeownership, it would mean a more stable population ready to help transform a sluggish local economy into one that is more vibrant. To that end, the volunteer organization has called a meeting to discuss how a community land trust might help create more ownership opportunities for both homes and businesses. 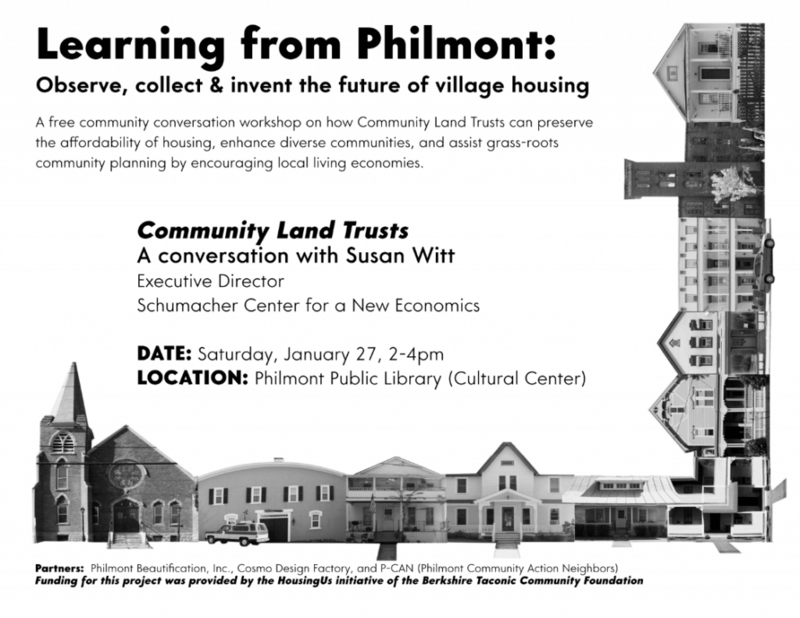 This meeting will take place on Saturday January 27th from 2-4 PM at the Philmont Public Library. Susan Witt, executive director of the Schumacher Center for a New Economics and co-founder of the Community Land Trust in the Southern Berkshires will be the speaker. The event is free and open to the public. Visit pbinc.org for more information and directions. Please join us there. The following is an essay by Susan that provides background on the history and application of the community land trust concept. On a shelf in the Library of the Schumacher Center for a New Economics sits a small wooden box with worn leather handle—13 inches by 8 inches by 2 inches. It opens to reveal the parts of an apparatus for spinning cotton. 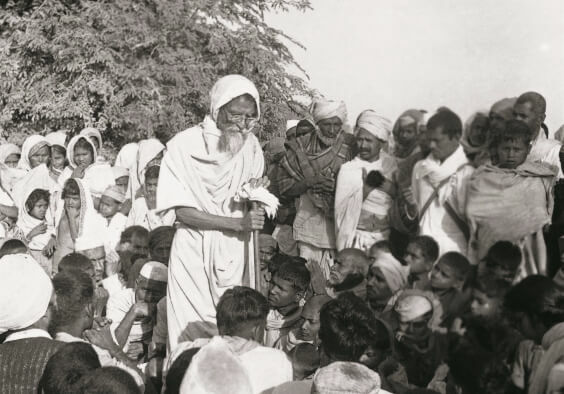 Govindra Deshpande presented this traveling spinning wheel to Bob Swann at the “Tools for Building Sustainable Local Economies” convened at Bard College in 1983 by the Schumacher Center. 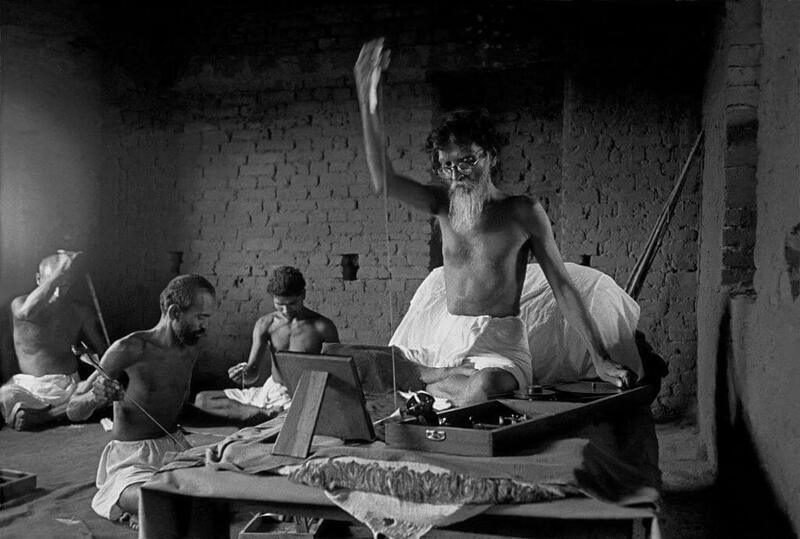 1953, Bihar, India, Vinoba Bhave spinning by Frank Horvat. For years the spinning wheel sat idle on the shelf in the Schumacher Center Library, the wooden box closed, the pieces unassembled inside it. No one knew how to put it together or use it. 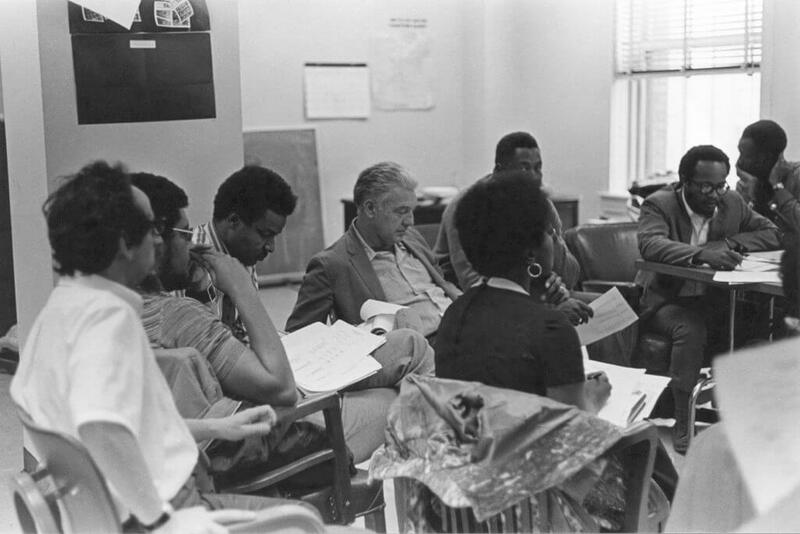 In October of 2012 Ron Gaydos, one of the participants of that 1983 seminar, visited the Library with a film crew. He is producing a film on the new economy with the working title of “True Value.” The Schumacher Center seminar had been a turning point for him in his thinking about economics, and the film would begin with the Berkshire projects he had studied then. A new movement for the Commons is being driven by the urgency to move land into the hands and care of next-generation farmers building resilient regional food economies.